Honesty with a bucket ? Strange site enroute to "Gallery Night"at the River East Art center on east Illinois Street Friday night. 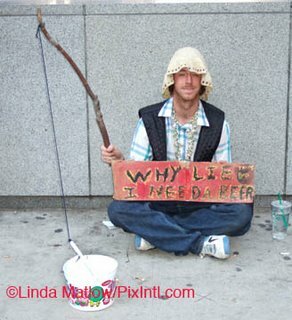 The man pictured was cross legged on the sidewalk sporting a pole with a string attached to a bucket and a sign that says,"Why lie I need a Beer"
Wanting a beer is ok.*Needing a beer* could be his problem...Hope he finds the help he needs! Photo: © Linda Matlow/PixIntl.com.All rights reserved.Photos may not be used without written permission. Mid July 2006...McCormick & Schmick's opens their new Chicago Restaurant in the loop at One East Wacker Drive. July 31..Legendary Chicago Sun-Times columnist,the late Irv Kupcinet will have a large bronze statue dedicated to him which would have been his 94th birthday.The unveiling will be at Wacker and Wabash Street. Lucky Strike for Nick Lachey ! Nick Lachey, in Chicago to promote his new album, "What's Left of Me" hung out and bowled with 200 VIPs at Lucky Strike Lanes on east Illinois Street.Lucky Strike Lanes in addition to being the most fun spot in the Streeterville area has an excellent impressive menu as well. I've been there quite a few times for events and their menu items are just as delciious as their catered party food.This time around I feasted on a cheeseburger with pepper jack cheese.Big portion cooked well-done as requested,I had to cut it in half and take the rest with me.It seems like there are so few places that will chance cooking food "well done"
in case it's over-cooked the customer may decline it for being too"well-done!" Photo of Nick Lachey and his fans at Lucky Strike © Linda Matlow/PixIntl(pixintl.com) All rights reserved.Photo may not be used or distributed without our written permission. Stars come out for Cartier! Cocktail reception and jewelry preview to celebrate the newly renovated Cartier boutique and benefit The Children’s Service Board of Children’s Memorial Hospital. Cartier, the international luxury goods company, hosted a cocktail reception on June 21st to celebrate Chicago’s newly renovated boutique as well as preview Cartier’s current Haute Joaillerie collection. 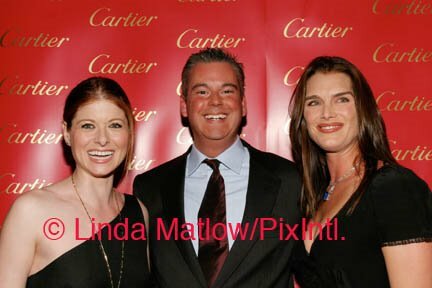 Frédéric de Narp, CEO and President, Cartier North America; Gerard Djaoui, International Director, Cartier; and Alexander Lord, Chicago boutique Director, Cartier; were joined by Debra Messing and Brooke Shields to host this special event. Guests enjoyed jewel-inspired cocktails and hors d’oeuvres while mingling with prominent members of the Chicago community and browsing Cartier’s exquisite jewelry collection. Cartier is supporting The Children’s Service Board of Children's Memorial Hospital with a generous donation plus 10% of all purchases beginning on Wednesday, June 21 at the event and continuing through Wednesday, June 28, 2006. Brooke and Debra arrived separately down the red carpet and had a good time posing for photos and chatting with the media. On fashion,Brooke was wearing Prada from head to toe and mentioned that she "saves everything!". Debra wore a black sleeveless Chloe dress and beige platform Chloe shoes.The goregous jewelry was all Cartier pieces. Cartier, one of the world’s leading luxury goods companies, designs, manufactures and distributes all of Cartier’s products. The company markets a broad range of luxury products including jewelry, watches, eyewear, fragrance, writing instruments, lighters, leather goods and scarves. In the United States, there are 33 stores including two in Canada. Founded in 1847, the House of Cartier has long been identified with quality, prestige and history and has served as crown jeweler to 19 royal houses. Cartier’s Chicago boutique is located at 630 North Michigan Avenue in the heart of Chicago’s Magnificent Mile and can be reached at 312.266.7440. Photo © 2006 Linda Matlow/PixIntl. Bar & Grill,. Contrary to previously published muck..Piven was very nice and on good behavior! Actress Kate Walsh of Grey's Anatomy flew in as well. 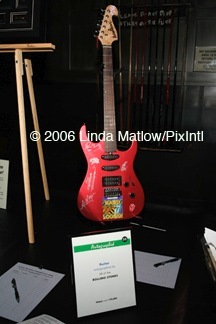 Tables of great items for the silent auction included a guitar autographed by all of the Rolling Stones which the highest bidder won for $7000.00. 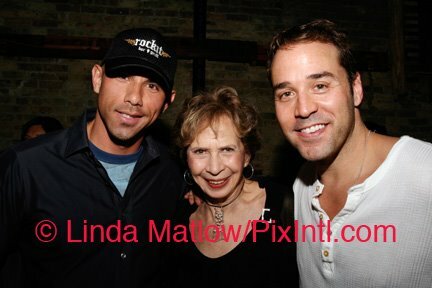 Pictured in photo: Billy Dec(Rockit Ranch),Jeremy Piven and his mother Joyce Piven. Photo © Linda Matlow/PixIntl. (www.pixintl.com) All rights reserved.Photos may not be used without written permission.